She’ll be sharing her story in a keynote talk on Saturday at Game Changers, a one-day symposium co-hosted by the Toronto 2015 Pan Am and Parapan Am Games Organizing Committee, CIBC and the City of Toronto. The event will be fostering discussion on the importance of diversity and inclusion in sport, featuring elite athletes like former Toronto Raptor Jamaal Magloire, Olympic and Pan Am hurdler Perdita Felicien and Paralympian wheelchair racer Josh Cassidy. McBean says investigating her sexuality wasn’t part of her experience as a young athlete, and it wasn’t until the early 2000s that she realized she was gay. McBean met her wife, lawyer Deanah Shelly, at a party back in 2010. They’ve been married since April of 2014, after a surprise wedding McBean planned because the pair couldn’t nail down a date. “I knew she wanted tulips, I knew she wanted white linens,” McBean says. Shelly was the only one out of the loop, with McBean telling her they’d be attending a party for Canadian figure skaters Tessa Virtue and Scott Moir — a ploy to get Shelly into a party dress. 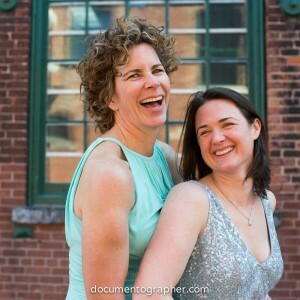 “There are countless funny details, but the best part was watching Deanah take in the room as we entered,” McBean wrote on her website two days after the wedding. Years earlier, during her time as an elite athlete, McBean says she was hyper-focused on her sport of choice. She recalls zeroing in on every detail while rowing: her balance, the pressure she was applying, what the water felt like and every little sound around her, all while blocking out the constant pain and screaming voice in her head encouraging her to quit. The focus paid off. 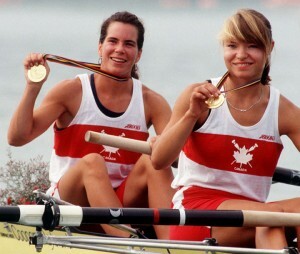 A day after her first time on the Olympic podium, McBean won a second gold in rowing for the eight event. Four years later, she won gold in the double sculls and bronze in the quadruple — making her the first Canadian to win three Olympic gold medals. She also won medals at the Pan Am Games and World Rowing Championships. Her string of wins came to a halt when she ruptured two discs in her back, forcing her to withdraw from the singles event at the Sydney Olympics in 2000. McBean, now a speaker and author, brings her personal experience into her mentorship work on the Canadian Olympic Committee. She encourages athletes to speak openly about their level of competence and ambition within their sport. She also urges people to be comfortable talking about their outside passions too — including their sexuality. She says female athletes have often been described based on their femininity or sexuality, but the focus is shifting toward their athletic ability. “I remember feeling very empowered when the 1992 team was dominating and they described us as dynamic and aggressive and competitive. And to me, those were lights on moments for women in sport,” McBean says. Things are changing, she adds, with more athletes able to be who they are, share their passions and express themselves in different ways. “There actually is no normal out there,” she says.